Okay, let's first get something out the way - this movie is not funny. At. All. In fact, it's a quite depressing. I mean, just look at the subject matter: a gay man who has lived the majority of his life in the closet. Yet, all the reviews - even the movie cover - have comments about how funny it is. 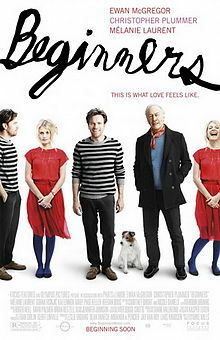 I rented this movie for two reasons: Ewan McGregor (yes, I love him too) and because it was supposed to be funny. It had a heavy indie movie vibe about it, complete with the casting of a French actress as the main love interest. Luckily, Melanie Laurent is cute because few things are more annoying and distracting in movies than improbable or flat out bad pairings of romantic interests. Christopher Plummer did a nice job in his role and considering he was up against Jonah Hill for Best Supporting Actor at the Oscars, I can easily say I am relieved he won. And I didn't hate it, though that's not a total ringing endorsement. It was just a bit slow. And not funny. Final word: It's not funny! But once you get past that, it's a pretty typical indie-type movie about love.